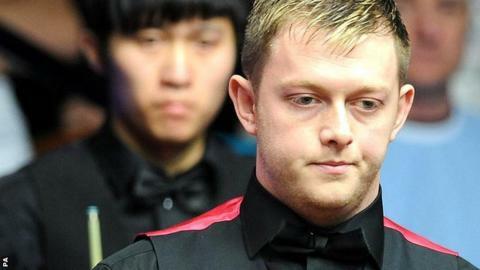 Mark Allen was knocked out of the International Championship in China on Thursday after a 6-5 defeat by Judd Trump in the quarter-finals. The Antrim player lost out in the final-frame decider to the world number two from England, who also beat Allen in the Shanghai Masters in September. Allen progressed to the last eight in Chengdu after victories over Robert Milkins and Cao Yupeng. The former world semi-finalist won the Antwerp Open last month. Allen booked a place in the quarter-finals thanks to a 6-3 win over Yupeng. The Chinese player beat Allen in the first round of this year's world championship in Sheffield. Allen was later fined £10,000 for accusing Yupeng of dishonesty. He claimed that Yupeng failed to declare an illegal push shot during their first round match in Sheffield, which Cao won 10-6.